New study showcases the amount of tax dollars going to subsidizing the sale of electric vehicles. Have you ever wondered how many of your tax dollars are subsidizing electric vehicles? The folks over at Edmunds’ Inside Line have just done the math and published their report, which is based on 2011 EV sales. Inside Line indicates that U.S. consumers purchased or leased more than 18,000 electric and plug-in hybrid cars in 2011, qualifying them for $135 million in federal tax credits. The $135 million in federal tax credits (18,000 multiplied by $7,500) primarily consists of Nissan Leaf and Chevy Volt sales. Nissan sold 9,674 Leaf EVs in 2011, making American buyers eligible for up to $72.5 million in federal tax credits. Additionally, U.S. consumers that purchased Chevy Volt EVs were eligible for upwards of $57.5 million in federal tax credits. Inside Line also notes that taxpayers are likely paying over $150 million when adding state incentives to federal tax credits. The U.S. Department of energy estimates that there are more than 500 tax credits available at the state and local levels. For example, California offered EV drivers a maximum $5,000 owners and lessees in the first half of 2011 and up to $2,500 in the second half of the year through its Clean Vehicle Rebate program. In fact, California registered 5,000 out of the 18,000 electric vehicles registered in 2011. Taxpayers may be forced to pay even more in tax breaks to EV owners if the Obama administrations new EV incentive program gains approval. Earlier this year, President Obama not only suggested extended the program, but also raising the incentive from $7,500 to $10,000. Despite government incentives, President Obama's lofty goal of 1 million EVs on the road by 2015 is growing increasingly out of reach. Although EV drivers earned approximately $150 million in tax breaks last year, that figure was minuscule when compared to the tax incentives provided to auto manufactures. The DOE has provided more than $10 billion to companies producing green vehicles, parts and batteries in low-interest loans and outright grants. The top recipients thus far are Ford ($5.9 billion), Nissan ($1.4 billion), Tesla ($465 million) and Fisker ($529 million). The following vehicles were eligible for federal tax credits in 2011: Nissan Leaf, Chevrolet Volt plug-in hybrid, Tesla Roadster, Fisker Karma plug-in hybrid, Smart Fortwo Electric Drive, Mitsubishi i and Ford Focus Electric. Each vehicle qualified for the same federal tax credit even though there was a huge price differential amongst the vehicles. In particular, the Mitsubishi i was the lowest priced vehicle on the list at under $30k, while the Fisker Roadster retailed for $110,950 in 2011. Doing the math, the IRS says that there are less than 100 million paying taxpayers in the U.S. (taxpayers who file and actually pay into the Treasury), at 90.6 million (2005 numbers, the latest I could find). So dividing $135,000,000 by 90,600,000 taxpayers gives $149 per paying taxpayer. That would be $1.49 per taxpayer, did you mean to omit the decimal? Umm... if you don't pay the tax (i.e. get a credit), then the money had to come from somewhere else to make up the loss in revenue. Either it was taken directly via a tax on someone or indirectly by printing more money and inflating the currency - another tax. I highly doubt the government bought $135 million less in weapons, ordinance, screwdrivers, etc. nor did they cut back on welfare or other social handouts. How hypocritial of the Obama administration and this generation of folks who think like them. Out one end of their mouths says the rich are getting too many breaks; then out the other end comes a subsidy that mostly favors the rich. So which is it? Fact is, the Volt lease is still $400-450 per month even after the subsidy. And many of those folks were originally looking at BMWs and G45s. which explains their disdain for articles (like mine) in the past which praised the Chevy Cruze especially the Eco over the long-term economics of the Volt. They were actually upset that I had the audacity to challenge their choice. Since they admit they could afford it, why did they get an incentive? The first automobiles were purchased by the rich, and they did not receive a dime of subsidy; but not this generation. So, how about a subsidy for the Cruze Eco buyer and the EcoBoost buyer? At least the volume of participants would be greater, and avail far more gas savings on a per capita basis. Let the liberal rants continue ad nauseum! How about the predominantly lower income military personnel subsidising gasoline with their lives, limbs and minds? The externalities of oil and other fossil fuels are significantly biased against low income populations. As these are tax rebates they are paid for proportionally based on the mount of tax each person pays so there is some equity in its funding. I do agree however that they could be means tested and phased out or not paid to those earning over some set amount. However I still believe the benefits are worth the $1-2 per taxpayer per year these rebates are currently costing. I surely respect your position and willingness to see another side. One thing bothers me, though. If lower income military personnel are supposed to be as important to the government as any other citizen, then why doesn't our government take oil off the table by simply making a viable interim energy policy which makes nat-gas the national fuel of choice at least through 2030 for national security reasons alone? Point is, the oil industry cannot be blamed for the failure of our government to act well on our behalf. Another point is, these tax breaks/subsidies may be low at least according to your per-capita reckoning, but still sets the wrong priority in my opinion toward national security for one simple reason: They cannot act fast enough or cover enough of the population's energy use to make a dent let alone a signifcant difference. All they make is a political statement and position without any teeth. Natural gas will without a doubt have a role to play in the transition either directly as a fuel for ice vehicles or indirectly to generate power for electric vehicles. I have to admit though I find your position very incongruous. You seem to oppose government intervention with subsidies for electric vehicles but support a government mandated transition to a natural gas economy, talk about picking winners. I totally agree change takes time but that seems a poor reason not to try, your suggested natural gas transition requires at least as much change if not more given that we already have a distribution network bringing electricity to every street in the US, something which would require massive infrastructure to achieve if we were to power passenger vehicles with natural gas. To me electricity is the quintessential example of a democratic power source, it can be generated from essentially any fuel or renewable resource so by choosing electricity we keep our options open. Hydrogen is similarly democratic as anything that produces electricity can produce hydrogen but at this stage the costs and complexity of using it as a transport fuel have it lagging well behind electricity as a viable fuel for personal transportation. That should read "viable tool for SHORT RANGE personal transportation." I agree with you that we shouldn't be picking winners via governmental force. Get the government out of the game altogether. You are directly contradicting yourself. "Why doesn't our government take oil off the table by simply making a viable interim energy policy which makes nat-gas the national fuel of choice at least through 2030 for national security reasons alone?" "I agree with you that we shouldn't be picking winners via governmental force. Get the government out of the game altogether." No it shouldn't read short range, current best in class EV's have 300 mile ranges with 80% 30 min recharges, I consider that entirely adequate for long range trips, in fact a 30 min break every 4-5 hours may well significantly decrease highway accidents. So with all due respect please don't put words in my mouth you make your points I'll make mine. Best in class, $100k+ EVs have it and also happen to have extremely heavy battery packs. Also assuming a "commercial grade" charger, not just your home outlet. Sorry, but it's gonna be a while before 300 miles per charge with a 30-45 minute recharge time is remotely marketable. The tesla model S due for release in July has a 300 mile model available for $69,900 after the tax rebate, expensive but not out of the realm of many mid-high range sedans and certainly what I would call marketable. Tesla has seen their battery pack costs fall by 50% in the last 5 years, their business plan has always been to release 2-3 high end vehicles to establish the brand before releasing an affordable sedan. If battery prices continue to fall then within 5 years they could shave another 10,000-15,000 off the pack costs and they could easily cut 10-15k of fluff out for an affordable model, which means they are on track to have a 300 mile 30-45 min recharge vehicle for 35,000-45,000, definitely marketable. You left out cost of the charger and you're assuming that Tesla's claimed price will be the actual price. Most of Tesla's pack costs have dropped not because of better tech, but because they can now buy in large quantities. As for their business plan, it has nothing to do with this discussion. We're talking about "300 mile ranges" in electric cars. Not Tesla's business model. 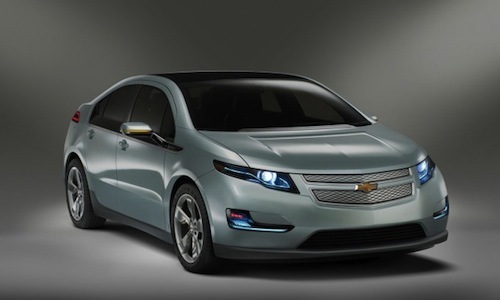 IF they can shave another ten thousand or so off of their packs, THEN the cars will be in the range of cost of the Volt. That MIGHT happen in the next decade. Meanwhile, ten years go by and... still no affordable 300 mile range electric dream catcher for the masses. Frank's point is that we have solutions RIGHT NOW that can be used TODAY. I didn't leave out or assume anything. Tesla are rolling out a fleet of high speed "superchargers" which will be available for the use of owners of th 260 and 300 mile versions. Tesla have also announced those as the final prices at least for all of the current booking holders of which ther are about 11,000, keep in mind they require at least a $5,000 deposit so they're not just an expression of interest. I don't believe the near term business plans of one of the main players in electric vehicle production has nothing to do with a discussion about the future of electric vehicles so you'll forgive me if I choose what I am and am not allowed to discuss. The reasons for the reduction in Teslas battery pack costs is likely a combination of economies of scale and improvements in manufacturing technology, but frankly who cares the fact is they have halved in price and that trend is continuing. I don't see why an electric vehicle with a 300 mile range has to be the same price as a plug in hybrid with a 100 mile electric range to be competitive, your not comparing apples with apples. I think electric vehicles have a strong future along with a range of other technologies in shifting from reliance on expensive dirty imported fuels to cleaner domestically produced fuels. Oops just realised that wasn't a reply from Frank, disregard the first part of the response. OK, I'm back, because you obviously wanted to rap on me. LOL. Look, I don't want my government making decisions like that, BUT since YOU were already OK with government mandates and in the mood for promotions, then at least lets get a decision and a promotion that helps all of the nation today, not in twenty years; and not just the few who can still afford it. Yes, I agree that electricity is ubiquitous, but fast charging is not. I doubt I would make Detroit to Traverse City in a day trip at your rate of present charging. The Volt would make it; and without loss of time. Furthermore, I have both electricity and nat-gas in my home. So why not have home-pumping stations to fill up nat-gas cars? Besides, electric fast charging does not bring the cost of autos down; it's the batteries that we still cannot afford; and that's why it will take many, many years. So, don't worry; it's not forever, just until your EV world becomes affordable for the masses. You may now return to your local programming and rap. I have no issue with natural gas cars and I would fully support them receiving the same incentives as electric cars, they have lower carbon footprints, divorce us from middle eastern oil imports and improve air pollution. If you take the cost of the middle eastern conflicts for example (I dare you to claim we'd be there if there was no oil) their annual cost is equivalent to a $5,800 subsidy for EVERY vehicle sold in the US. Add in the cost of events like the Horizon disaster and spill clean up and the health burden of smog from ICE vehicles there are costs to the US taxpayer which represent far higher costs than the $7,500 for alternative fuel vehicles. That is why I support incentives for all alternative fuel vehicles, hybrid, plug in hybrid, electric, natural gas, even hydrogen. I firmly believe the costs of incentivising their uptake is considerably less than continuing the status quo. I don't believe any one of the options will be a silver bullet I think we need a range of options for different situations. If a winner appears out of the pack great, but I see no benefit in the government trying to pick that winner, let the market do that. The government should support the pack however. It appears that we agree on everything but incentives, Rob. I personally don't think anything should be incentivized by government - not cars, not oil, not alt fuels.. not anything. Markets tend to do things themselves and we don't need government meddling to screw it up.